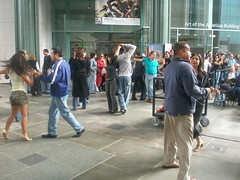 The Latin Sounds Music Series at the LA County Museum of Art is underway. The free music event is held every Saturday between 5 and 7pm, May thru September. When the weather cooperates, it’s perfect for an early evening picnic listening to music from Spanish-influenced corners of the world. Tonight’s performer is Louie Cruz Beltran. Beltran is an adept percussionist with a sounds based on Afro-Cuban and Brazilian rhythms. His shows are great fun and always get people on their feet. You may want to contact the music department, (323) 857-6115, before you arrive to make sure if the recent rain will move the event to from the Dorothy Collins Brown Amphitheater to the courtyard of the museum.